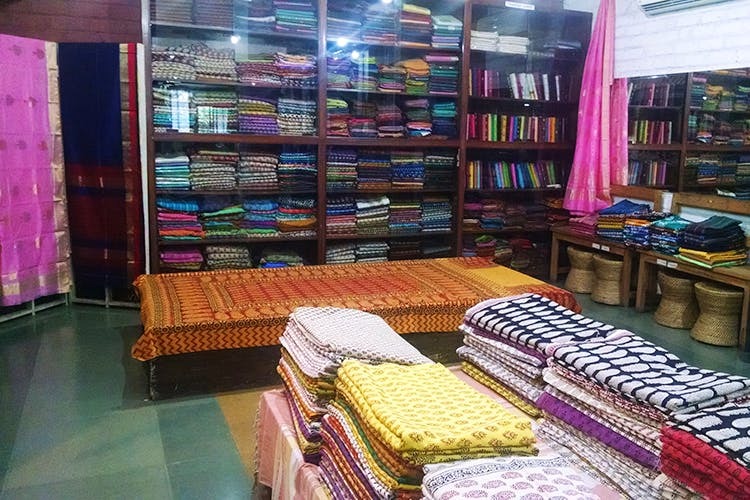 Mrignayanee, located at Koramangala’s BDA complex, is the place for gorgeous Chanderis, Maheshwaris and Kosa Tussar sarees. Plus, they also stock up on fabrics for dresses, for home and office furnishings, and handicrafts too. If you love pure cotton block printed fabric at reasonable prices, then Mrignayanee, a unit of Madhya Pradesh Hastshilp Evam Hathkargha Vikas Nigam Ltd, in Koramangala, is a must visit. Their starting prices are INR 140 a metre which is the same price for a majority of their fabric. They also stock dress material in cotton and silks. Plus, we are tripping on their stock of gossamer Chanderi and delicate Maheshwari sarees other than dabu printed cotton sarees (perfect for work wear). The cotton block printed fabrics here are a must buy because the quality is rather good. You can convert them into dresses, tops, kurtas, pants and make very good comfort wear. If you love your good old Chanderi classics, then this is the place to be for good quality and prices. Apart from fabrics and sarees, we have a spotted tribal brass decor pieces and home linen-like bedsheets, tablecloth and even gorgeous dhurries for the home. They have Mahdubhani and Gond paintings for sale and an in-house artist painting on the spot. Their Chanderi saree collection is vast but you may not find contemporary designs.